Every year, my son wants things to be more and more extreme when it comes to Halloween. If it’s not some crazy macabre costume, he’s asking me to bring something icky to his class party. It’s never ending when they’re growing-up! LOL! 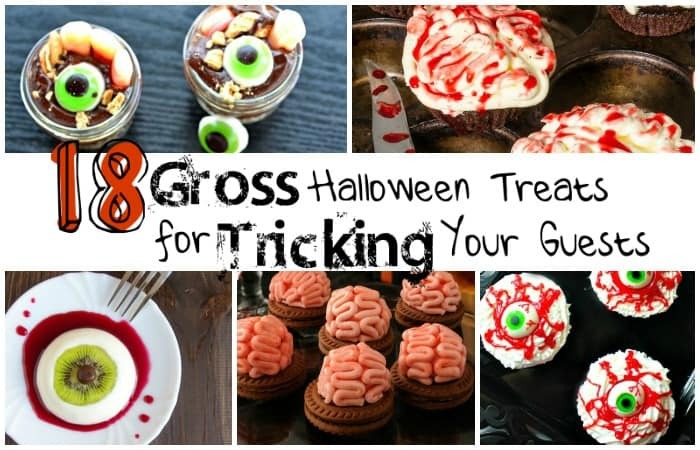 This year, I’ve done my research and I’m prepared for that “gross snack” request with these 18 Gross Halloween Treats for Tricking Your Guests. I’ll be rockin’ his socks, for sure. Very gross-looking (but incredibly yummy) Bloody Eyeball Panna Cotta (which is really just a fancy word for pudding-y-stuff) from Nerdy Mamma. Crazy-cute Monster Tarts from across the pond at Eats Amazing. Blue-inside Bloodshot Eyes Cupcakes from Parenting Chaos. Fast and easy Body Parts Pudding from Totally the Bomb, which is totally–well, the bomb. Simple recipe for Bug Juice from Simplistically Living. Yucky Beet Risotto, which is tasty, but very yucky looking from Food Done Light. Easy, no-bake Zombie Brain Cookies from Nerdy Mamma. Definitely Eerie Alien Deviled Eggs from Quarter Life Crisis Cuisine. Disgusting-looking Rat Loaf Meatloaf from Kudos Kitchen by Renee. Not-super-gross-but-gross Ghoulish Green Purple Sweet Potato Mug Cake (which sounds awesome actually) from Strength and Sunshine. Deliciously gross (and kinda healthy–but in a way kids will love) Avocado Monster Eggs from Living Sweet Moments. Deceptively easy Creepy Eyeball Cupcakes from Nerdy Mamma. Super-silly Witch Guacamole Dip from Spicy Southern Kitchen (love the mole). Yummy, I mean yucky, Brain Cupcakes with Wine Shooters from Hezzi-DS Books and Cooks. Easy, if deadly, Zombie Graveyard Pudding Cups from Comic Con Family. Gore-licious Chocolate Cherry Shake from the Frugal Foodie Mamma. Bloody Spooky Slasher Brownies from Happy Food Healthy Life. Icky, but tasty Brain Cupcakes from Nerdy Mamma. 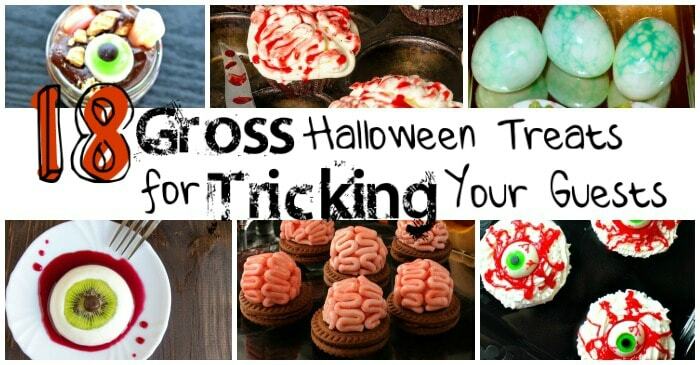 Now I just have to decide which of these 18 Gross Halloween Treats I want to make. Such a simple decision that is totally lame…I’ll probably have to make them all now.